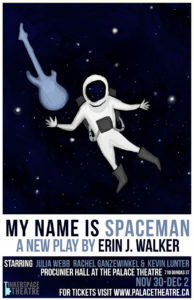 Playwright and director Erin J. Walker has harnessed that parallel in a most creative way in the new Tinkerspace Theatre production of My Name Is Spaceman . In the earthen realm, Jamie (played by Rachel Ganzewinkel) and her brother Gabe (Kevin Lunter) have come to the side of their mother, Joan (Julia Webb), who is undergoing chemotherapy. It’s bringing her down, and later on we learn just how much in her life she feels she’s failed at. However, the “hippie music teacher” has managed to nurture two kids into adulthood who have both sought out respectable careers – Jamie as a prospective aerospace engineer and Gabe as a pastor. Joan’s illness, however, has thrown the family into crisis. The unknowns they’re facing manifest an alternate reality in outer space. In this corresponding universe, Jamie, Joan and Gabe are now Spaceman, Captain, and the spaceship’s artificial intelligence, Zwicky (think HAL from 2001: A Space Odyssey ). Just as in the earthen realm, Spaceman—on the recommendation of Zwicky—goes to the aid of the Captain, whose own ship has been felled by an indescribable menace: an all-consuming, chaotic darkness that Spaceman initially mocks as not even existing (but is metaphorical of the cancer that is taking hold of Joan in the earthen realm). Ganzewinkel plays Spaceman/Jamie with fiery conviction. Her forthrightness and by-the-book logic masks the frustration and fear that her mother’s illness has given rise to. Lunter gives a sublime, solid performance of the jaded holy man who sublimates his desire to do God’s work into supporting his mother and sister. He realizes that there are no easy answers. In the space realm, Zwicky’s directives get muddled and incoherent as the ship enters the dark chaos, mirroring Gabe’s increasing questioning of his faith and life’s path. The mother/daughter relationship carries over from the earthen to space realm as well. Spaceman barely tolerates the Captain, and is suspect of her explanations, as a teenager would her mother. Later, in the earthen realm, Jamie doesn’t initially accept Joan’s wishes to stop treatment and return home, just as earlier, Spaceman doesn’t buy that a vast darkness was responsible for the distress of the Captain’s ship. The darkness that destroys the vessels is like a debris field—except you can’t see the debris, and the field is limitless. Transitions between the earthen and the space realms are ushered by a trio of celestial beings who are simultaneously majestic and mischievous. Like a parent guiding two spirited children, a kindly Demis Odanga as Morning Star gently navigates Tyler Graham as Red Star and Andra Zlatescu as Evening Star. Together they provide levity that offset the seriousness of the plot. As the intermediaries between realms, they remind us that we’re all spiritual beings in a playful yet poignant way. Joan’s near-death experience that opens the second act is the highlight of the show. The versatile Webb is perfectly cast as the woman whose non-existent relationship with her ex-husband and unfulfilled dreams of making it as a musician have cast a pallor over her future; her cancer diagnosis only further plunging her into the belief that a joyful existence is far from a foregone conclusion. The final scene is sufficiently cozy and reminiscent of the security and innocence of childhood to emotionally bring the space realm down to earth. The costuming and props—particularly the captain’s hat worn by Webb and the cardboard coverings of the spacecraft’s chairs—resemble crafts done by a child, reflecting the aspirations of young Jamie, who dreamed of someday being an astronaut, as well as the boundless imagination of childhood. All in all, My Name is Spaceman is a very special and visionary piece that will have show-goers pondering the meaning of life long after it’s over.